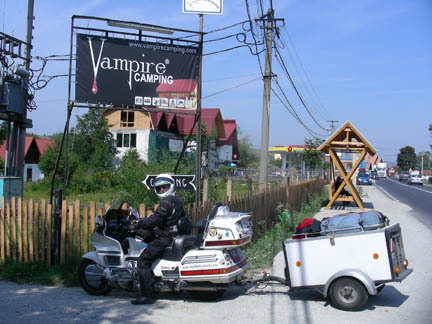 We entered Romania in the NW corner and headed along the border with the Ukraine towards the town of Sapanta. There are two things here to visit. 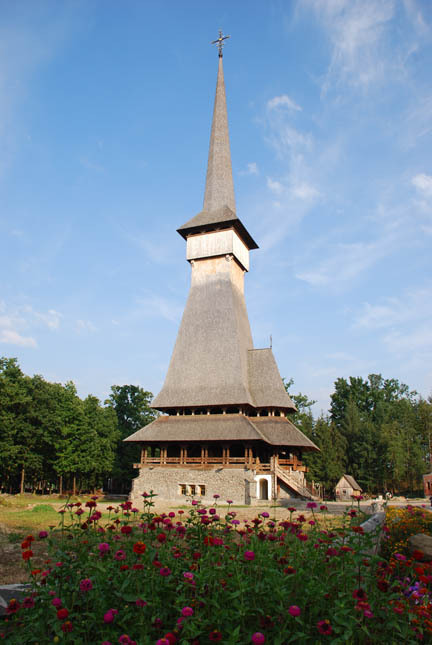 The first is the highest wooden structure in Europe, this church, which is still under construction at a local monastery. There is also some controversy about its claim. It has a high stone base, visible in the photo, that may take it out of that category. But then the wooden stairs come all the way down to the ground. Anyway I'm sure glad I didn't have to do the shingle roof! Each shingle has a carved lower edge that gives it three points pointing down, and there must be several million of them! The other claim to fame was the town cemetery. But we viewed that after "camping" in a farmer's field. The farmer had a sign out front advertising rooms and it had a small tent symbol for camping on it. He wanted to rent us the room but we insisted on the "camping" and he put us behind the barn and let us use the toilet/shower for the rental room. Here is a friend of his bringing in a load of hay he cut that day, right past the "camping" area. 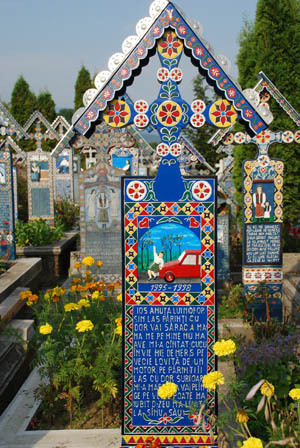 The "Merry Cemetery" is the other sight to see. 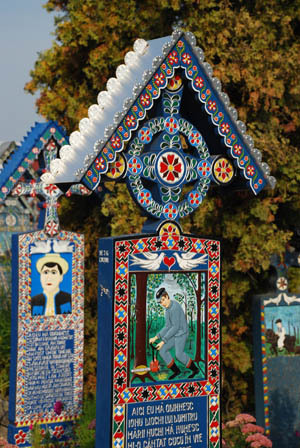 This cemetery has over 800 of these monuments dating back to 1935 when a local woodcarver and artist started building them. The picture commemorates an important event, job or hobby in the persons life. The text is often satirical and/or comical describing the person and their life. The young lady on the left was only three when she died, we assume she was hit by a car, we don't read Romanian. Today the original artist and woodcarver is also interred here and one of his apprentices has carried on his life's work. From there we headed over some mountains on the absolutely worst road we have ever been on!!! Its surface consisted of tens of thousands of overlapping patches, where there weren't new holes! We travelled for about 80 kilometers (50 miles) of this road. 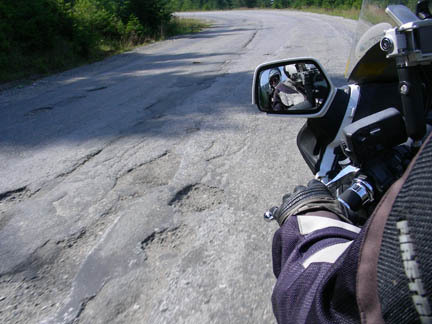 Romania has the worst roads of any country in Europe. It is also an extremely poor country and with its partial entry into the EU last year some money is being invested into its roads, but they have a long way to go. 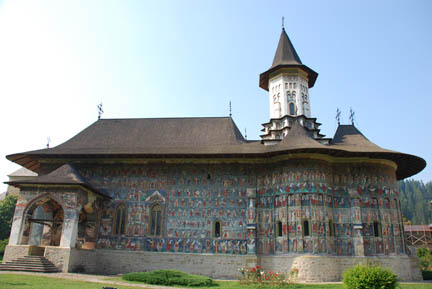 We toured three of these fortified, painted monasteries that have been in NE Romania since the 15th century. This one is Sucevita. Each of them was essentially a fortress with a monastery in the middle of it. 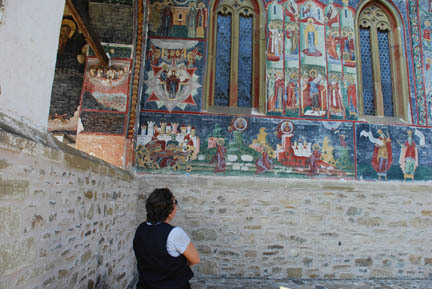 They were painted inside and out with pictures of events and people from the bible. Right above Kathy's head is a scene of a castle wall and in front of the wall 25 people are being beheaded. All of the victims are wearing halos. (I don't know which story in the bible this depicts.) There was a lot of pictures of beheadings scattered over the walls, inside and out. It must have been a popular execution style here. 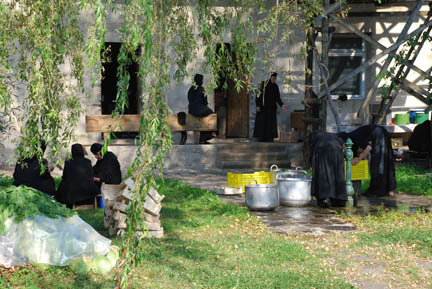 Although tourists are allowed in, these are still working monasteries. Here the women (and each was staffed only with women) are preparing vegetables for storing for the winter. They were cutting them and putting them in large jars, maybe for pickling. It cost 3 Lei for each of us to get in and an additional 6 Lei to take photos. A total of about $5.00 US. A lot better than the equivalent of 74 US dollars we paid to tour the salt mine and to visit several major museums around Europe. We are finally beginning to make up for the immense amount of money we spent in Scandinavia, especially Norway. Charging an additional fee to take photos or video is a very common practice, especially in Eastern Europe. From the monasteries we moved on to Bran Castle. It was started as a lookout tower on its rocky knob in the 1300's and has been improved and remodeled ever since. 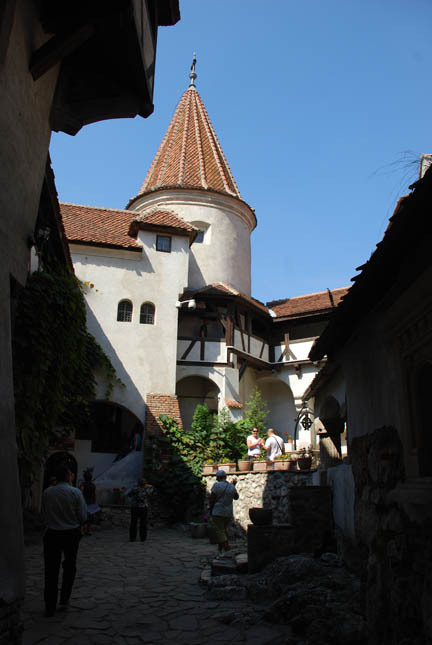 Bran Castle is famous as "Dracula's Castle". Actually Count Vlad "the Impaler", on whom the stories of Dracula are based, only stayed here for a couple of days when he passed through the area. Somehow the tourist industry has adopted this really quite charming little castle as the famous vampire's own. There are dozens of tourist souvenir booths at the base of the hill below the castle. Count Vlad got the nickname "the Impaler" after the Ottomans sent 6,000 soldiers into Romania to take the area but the Count's troops killed them and their heads were impaled on stakes in the mountain pass they had used. Later when the Sultan took an army and attempted to conquer the area through the same pass, the Sultan's troops saw the 6,000 impaled heads and quickly ran back home. During the 1920's and 30's Queen Maria of Romania lived here. I found it to be a very nice, small castle of small rooms, at various levels, around a courtyard with overhanging balconies. It would have been a great place to live. In Bran we stayed at "Vampire Camping". Actually a very adequate campground. For Romania it is a very good campground. As I said above, this area is crazy about the fictitious Count Dracula! 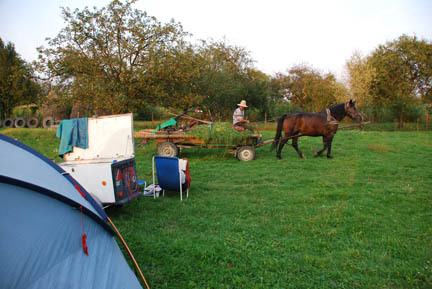 There is very little camping in Romania and we have stayed at hotels several times. 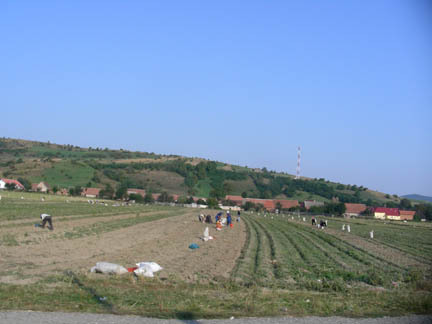 Romania is a very agricultural country. Most of the people still farm for their basic subsistence. These fields of hay were cut by hand with a scythe and hand piled on the racks to dry. We had several of these racks right in the middle of the Vampire Campground where they had harvested the grass and were drying it. Here the man is harvesting the grass growing in the roadside ditch, with a hand scythe. We saw this kind of poverty and complete use of resources in Morocco too. Also notice the woman farther up the road. The women in Romania start out good looking as young women, in middle age they take on the general dimensions of a fire hydrant, and once they are widows they are not much taller than one. They shrink and become bow-legged. Life here is very hard on both the men and the women. We passed at least a hundred horse carts a day. 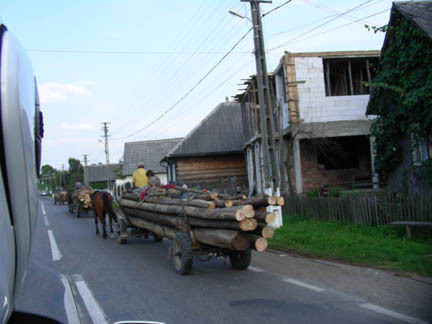 Here are three horse-drawn farm carts loaded with logs. We saw them loaded with hay, potatoes, logs, firewood, boards, and in one case, vinyl framed insulated windows. Somebody's house was getting new windows, but they were picked up in the horse cart! Did I say Romania was poor? Here are potatoes being gathered by hand. This is not "gleaning" this is harvest! We saw it many times and it looks like the whole family turns out to gather them, there are men, women and children all out there filling the sacks. 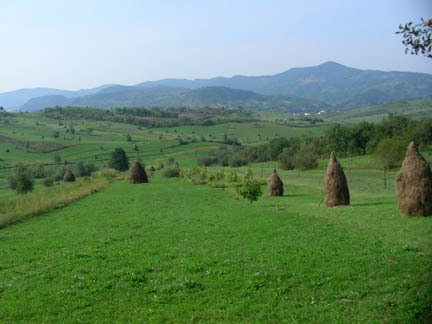 Romania has some fantastic scenery. Lots of mountains and gorges. 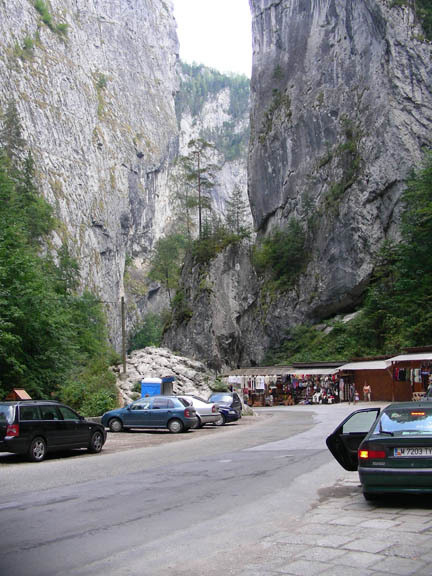 Here we travelled up an extremely narrow gorge with tourist shops at each slightly wide spot in the road. Again it reminded us of Morocco and the Gorges Dades. Then we found a pass to go over, Transfagarasan Pass at about 6800 feet high. Going up the north side the road was not too bad (the side pictured) (we started way down in the distance in the valley bottom). Going down the south side the road was terrible! The road surface was in terrible shape and this was a Saturday and the locals were out in force, wild camping and picnicking. One of the biggest problems in this country is that the Romanians are terrible litterers. They come, camp or picnic and leave all their trash behind. Every possible place big enough to park was covered with trash, wrappers, bottles, plastic, paper, etc. I feel this shows a poor pride in home and country. And they don't know how to get off the road to park, so many of the popular places were closed down to a single lane with parked, and double parked, cars, vans and buses. With no traffic control this made it interesting to get through. Many oncoming drivers felt that a motorcycle, even one as large as a GoldWing towing a trailer, could just get out of their way. Like other eastern European countries that have been behind the "Iron Curtain", they are lousy drivers. I won't run though the list, just assume if it can be done wrong and dangerous, but will advance their car a few feet, they will do it. Never mind that 50 or a hundred feet of advancement for them risked our lives. They thought that their second or two of time saved by passing was more important than our lives. But this has become so common that I now expect it and am no longer surprised! It has been a very interesting time in Romania but it is time to to go to Bulgaria and visit the Black Sea.